The Freestanding Heavy Bag is the perfect solution to reaping all the benefits of working out with a heavy bag without the hassel of putting holes in your ceiling or messing with a heavy bag stand. I have narrowed down some excellent choices when it comes to freestanding bags. There are some great ones and some...not so great. Be sure to check out my reviews before you purchase one. While the freestanding bag is generally thought of as an innovative new concept, freestanding bags have actually been around for hundreds of years though in the days of old, they were in a more rustic form of course. Heavy bag work has been used in martial arts for as long as there has been a written history of training and the freestanding versions have been in play for decades as well. One of the oldest on record is the Makiwara which is an ancient karate conditioning tool. The Makiwara was and still is used by karate practitioners to practice strikes in much the same way as a boxer uses a heavy bag. 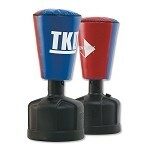 It develops striking ability by allowing them to experience resistance to punches, kicks and other strikes. The most common type consists of a 7-to-8-foot-long post which is pounded into the ground, so that it is just about shoulder height. It is tapered from the bottom to a thickness of 1 cm at the top. A pad of rice straw was bound to the top with rope to form a striking surface, thus forming one of the first standing heavy bag. 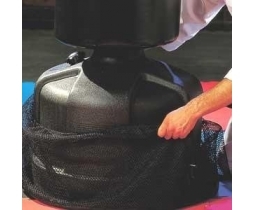 The Chinese Mook Jong is another ancient form of the freestanding heavy bag. Used in the martial art of Wing Chun and other kung fu styles of Southern China, it was traditionally made from wood but more modern forms of the dummies are now also made from steel and plastic as well. A number of versions of the Mook Jong existed and gave way to some of the creations we know today like the Wing Chun Dummy. 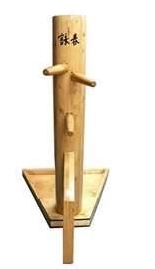 The Wing Chun Wooden Dummy is constructed with an arm and leg configuration which is designed to promote fighting skills and chi at the same time. 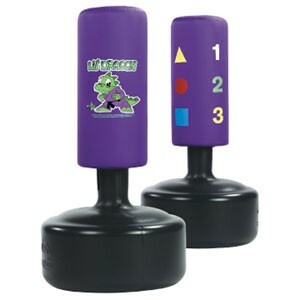 Older versions of the apparatus were originally placed into the ground but the modern version is more practical in design and can be used at home or in a studio or gym. Today extensive research goes into perfecting the freestanding heavy bags that were conceived so many years ago. 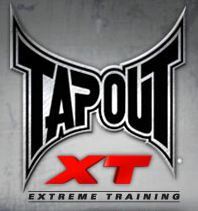 State-of-the-art technology and constuction makes for optimal MMA workouts. There are many makes and models and even lifelike human replicas such as the Body Opponent Bag line. Which freestanding bag is best? Although I surely have my picks (which I will share), which one is the right for you depends on what you hope to achieve with it. If you are working on your endurance and aerobics, a cardio bag will suit you while if your intent is to practice packing punches, you will want an extra large one. Check out my reviews below to find out more. Wavemasters are a favorite of mine and for a great reason...they work! Manufactured by Century, there are a number of Wavemaster models to choose from. And because they are made by Century, you can be sure that each and every one is of quality construction and quality materials as well. 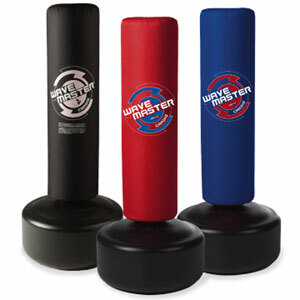 The Original Wavemaster has a durable vinyl cover and high density foam so you can give it your best kicks, strikes and punches. The base can be filled with sand or water and is rounded so it can easily be rolled into a corner or into a closet. Eight height adjustments move the bag from 47' to 68' allowing so you can practice kicks and punches at different heights. 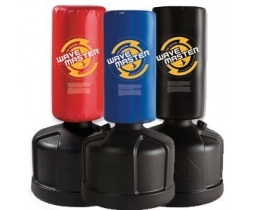 As far as freestanding heavy bags go, this is great for students, beginners and children to take their training to the next level and it is affordable too. 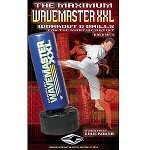 But if you are advanced or a heavy hitter, you might want to consider the Wavemaster XXL. This version is approximately 270 lbs when filled and is available in Black, Blue or Red. 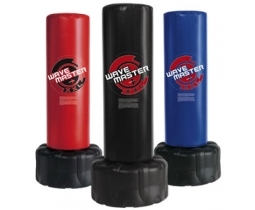 The Aerobic or Cardio Wavemaster (also known as Wavemaster II) is built longer to accomodate a longer striking area. The primary reason that the bag was developed was to provide a way to perform a boxing or kickboxing workout in the home or gym without the common problems associated with traditional bags such as having to hang them or use a stand. This bag is excellent for cardio workouts because it is designed to take light hits, over and over. What exactly is a Cardio Workout? Cardio, of course, means "having to do with the heart" so a cardio workout is an aerobic exercise, which means an exercise "with oxygen." During aerobic exercises your muscles rely on oxygen to do the job at hand. Aerobic workouts will not only improve your heart and oxygen level but in doing so, provides you with more endurance which is of utmost importance because we all know you cannot win a fight if you can't finish it! Bag height alone is 40" and is constructed of high-density foam with poly-shell. The low profile base fills with sand or water and is rounded for easy rolling. Four height adjustments take it from 53-1/2'' to 65-1/2". The bag comes in your choice of red, blue or black. As I mentioned before, the Wavemaster XXL is my favorite of the Wavemaster line. It is a larger version of the Original Wavemaster and holds up to all you can dish out. This is Century's ultimate bag because it has largest kicking and punching surface area on the market which speaks volumes. Standing 69' tall and a full 18' in diameter, the available surface to train on is phenomenal. And it's very durable with strong vinyl construction over high density foam. The low profile base and large new bag provide an excellent target for both punching and kicking and it is extremely stable so it doesn't scoot around. As with the other Wavemasters, it has an extra large fill hole and cap allows you to easily fill base with sand or water. No tool required for assembly and weighs approx. 270lbs when filled. It is available in black, blue or red. 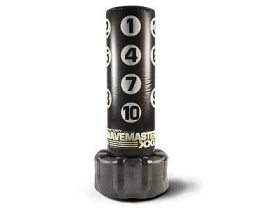 The Wavemaster XXL with Scoring Zones is a fantastic bag for perfecting strategic moves. There are ten scoring zones on this Wavemaster and each one represents a key body point so you can pin point exactly where you want to land your kick, punch or strike and grade yourself. Standing 69 inches tall, the bag is a full 18 inches in diameter so there is a lot of striking surface. It is made of durable vinyl over high density foam and the sturdy base is easily filled with sand or water making it weigh about 270 lbs. when full. 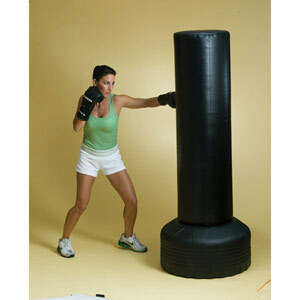 The bag is a nice looking addition to your training equipment and is available in black with zones as pictured. 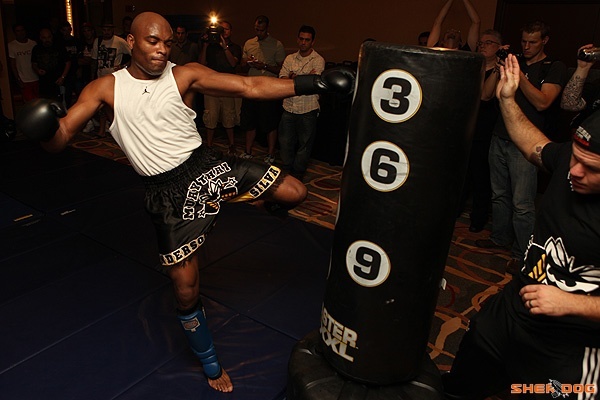 If Kickboxing is your discipline of choice, you have got to check this out! 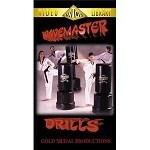 It's the TKD Wavemaster and you're going to get a kick out of it. A cone shape top creates an ideal angle for kicks plus it has target zones on each side, one red and one blue. High quality vinyl covers high impact foam so it's going to last. As with the others in the line, the base fills with sand or water and is rounded for easy roll. The TKD weighs approx. 270 lbs when filled. Designed especially for the young aspiring Martial Artists, this bag provides the benefits of a Wavemaster just in a smaller package. This pint size version will help your child develope the skills that are critical to the martial arts like accuracy, endurance and agility. It features four height adjustments and a rounded base for easy rolling. The Lil' Dragon Wavemaster logo is sylishly screened on one side of the purple bag, while the other side is screened with three colored shapes and numbers. A durable nylon shell covers high impact foam. The Kid Kick Wavemaster is another excellent child version of the Wavemaster. It is one of our best sellers and rightly so as it is a mini version of the adult Wavemasters. As with the larger versions, the base is filled with sand or water. It weighs approximately 170 lbs. when full. There are four height adjustments taking it from 37" to 52". I highly recommend this bag and love the Kid Kick package which is the Kid Kick Wavemaster, Kid Kick Block and Kid Kick Shield. 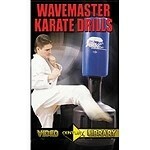 There is also a Kid Kick DVD that offers some great advice and instructions. 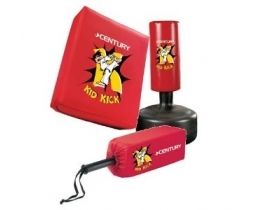 Century also has a line of Body Opponent Bags which are freestanding as well. These lifelike mannequins are so realistic you can practice your kicks, punches and strikes as if they were real opponents. 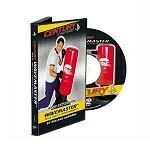 Fantastic for sparring and weapons practice, BOB also serves as a great target for self-defense training. There are three BOBs in the line, Sparring BOB which is the regular sized bag, BOB XL which offers a larger torso and a groin area as well and BOBBY BULLY for the young Martial Artists. My favorite is BOB XL because I like training with the larger space. This is a good bag with good reviews. 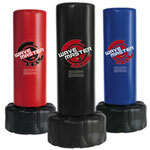 Just like all freestanding kicking bags it is convenient and can easily be rolled into the corner or tucked away in a closet. How good is the bag? We found great reviews giving it a 5 of 5, so I looked into it. No doubt, it is a great bag in many ways. Like Century's Wavemaster line such as the Wavemaster, Wavemaster Cardio and Wavemaster XXL, it is made of high impact foam, with a durable vinyl cover. The base can be filled with water or sand. When filled, the weight in the bottom of this base is 120 pounds which allows for enough stability for a pretty good workout. In comparison, Century's freestanding heavy bags weigh in at 270 pounds, so this base is not as sturdy. Keep in mind though that not all workouts require strong punches and kicks so you may not need a heavy base. In fact, there may be situations where you are looking for a lighter base such as if you live in an apartment where your flooring might not hold up to a heavier one or if you plan to transport it a lot while it is filled. The top of the bag is 56 inches high and it is 17 inches in diameter. The base measures 17 inches high and is 27 inches in diameter. When empty, the top weighs 24 lbs. and the bottom weights 40 lbs. When filled with water, the top is 24 lbs. and the bottom is 120 lbs., totalling 144 lbs. The bag will hold up to your stikes and kicks, especially if they are not always applied with full force. Since one benefit of a freestanding bag is for cardio workouts like reps, you may not be needing to hit with a lot of power anyway so this bag would certainly fit your needs. If you will be working out with a lot of power, I'd go with the Century Wavemaster instead. Since the RevGear Freestanding Heavy Bag is made by RevGear, you can rest assured that it is well made and that the quality is backed up by the company. Revgear RevGear has been on the MMA scene since 1996. Founded by Paul Reavlin, Revgear is a leader in the innovative technology of creating and producing Martial Arts equipment. Much like I, myself, got into retail due to the frustration of trying to locate good quality MMA products at reasonable prices, Paul Reavlin grew frustrated with the existing training equipment on the market. He became so disgusted with false claims of quality and poorly designed products, he decided to create his own line. That he did and Revgear was born. You can be comfortable knowing that RevGear is on your side. The company does strive to bring Martial Artists training equipment to meet their needs and budget and also has excellent customer service. A number of UFC greats are fans of RevGear like Brendan Schaub, Ben Rothwell and a score of others. Along with this freestanding heavy bag, at Revgear.com you will find a selection of other heavy bags, gloves, clothing and just about any piece of MMA Equipment and Gear you are looking for. 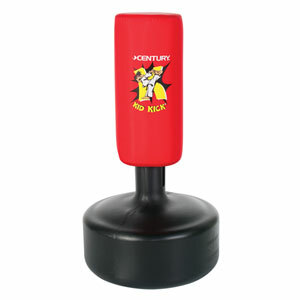 If you are kicking around the idea of purchasing the RevGear Free Standing Punching Bag, I would say as long as you are not looking to pack powerful punches, this might be a really good option for you. Enhance your workout with instructional videos and other workout tools. Not only do these lessons teach the optimal methods to use the equipment but offer helpful hints and other suggestions as well. Don't forget to order a Wavemaster Base Cover so you can protect your investment. Covering your base is a very inexpensive way to add to the life of your Wavemaster so be sure to order one now. This cover fits all freestanding Century products, including the Wavemaster, Wavemaster XXL, BOB and BOB XL stands.